With only a few days to go, the most authoritative world publications, such as the FT and the Economist, unabatedly continue to throw weight behind the claim that the elections are a referendum on Abeconomics. But they are not. 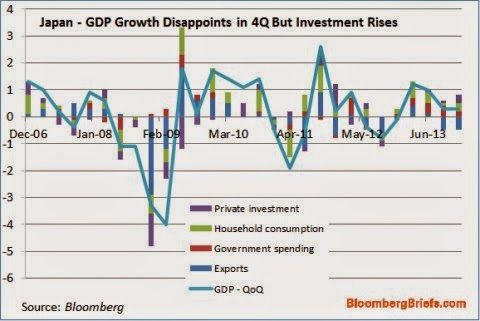 The Japanese economy is sliding badly, and much has to do in some way or another with the Abenomics. The real judgment on Abe “the Archer” and his three arrows is the real GDP’s abysmal sliding over the past two years (see the graph from BI). A governmental report just revealed yesterday enlightened the ugly truth about the state of affairs of the Japanese economy – in the 3Q the economy has shrunk with an annualized 1.9%, thus sliding the real GDP growth to at 1%, far shorter than the expected 2.8%. Economists debate what element(s) in their analyses must have gone wrong, focusing on a detail after detail. What they really miss, however, is the big picture. And this picture is so big, that resembles the case of the classical Sci-fi novel by Stanislaw Lem, Solaris, where the extraterrestrial mind that was causing many of the calamities was so magnanimous, it was actually the entire planet. But one could see that only when pulling out in a cosmic distance, which of course no protagonist could do. I claim that in similar vein, Japanese elections and Abenomics are still elements in a much bigger picture. But its mere size is so huge, that it is hard to even recognize its shape, so analysts usually discuss it as a blurred political background color, on which the current events take place. 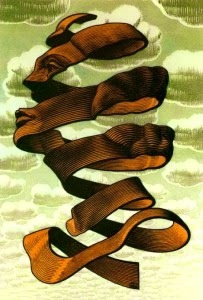 But it is not – in reality all these events are elements of the picture. It is all about the American strategic pivot to Asia Pacific (happening or not in real terms), and the new-old strategic partnership between Japan and the USA. In reality, if Japan is to emasculate itself through abolition of Article 9 of its constitution, and perhaps on the long run through developing a nuclear program of its own out of the number of nuclear power plants that are gradually restarted after the Fukushima calamity, then the laws of great power politics dictate that inevitably the country will also embolden its foreign policy positions, and if not tomorrow, or after 20 years, than certainly in 50-years time it will aspire to become a player that is more likely to become a balancer that will switch alliances between two super powers – USA and China, than a faithful ally. American foreign policy makers know that all too well, and the trade-off of Japanese military and foreign policy emasculation is an even greater dependency of their economy. In this context Abenomics is a crucial systemic element that should “globalize” the Japanese economy beyond its current condition. If anything, Japan should already be considered a champion of globalization in more than one ways. But just like there are all different kinds of democracies, so there are also different types (or rather aspects) of globalization. The one I am referring here is a distinct type of subjugation to powerful systemic forces that are not elected, not appointed, they are not held accountable by anybody, and they do not concern themselves with issues of humanism. These are financial corporations – the likes of Moody’s and the IFC – who move mountains with the tip of their index fingers. The structural reforms – the most contested and apparently most resisted by the mid-level Japanese administrative apparatus, although done in a very Japanese way with a mixture of passive-aggressiveness and pretense of ignorance – are the bridles that are needed to be put on Japan, in order to make sure that its military emancipation doesn't go in disarray. This trade-off, let’s be clear, is not necessarily a bad thing for Japan. The existing close relationship between the two countries has made Japan what it is today – an economic giant, and an example of economic modernization and democratic consolidation – all this out of the ashes of Hiroshima, Nagasaki, and the fires of Tokyo and Osaka. Even without the Abenomics, Japan’s economy is already more than dependent on the American. 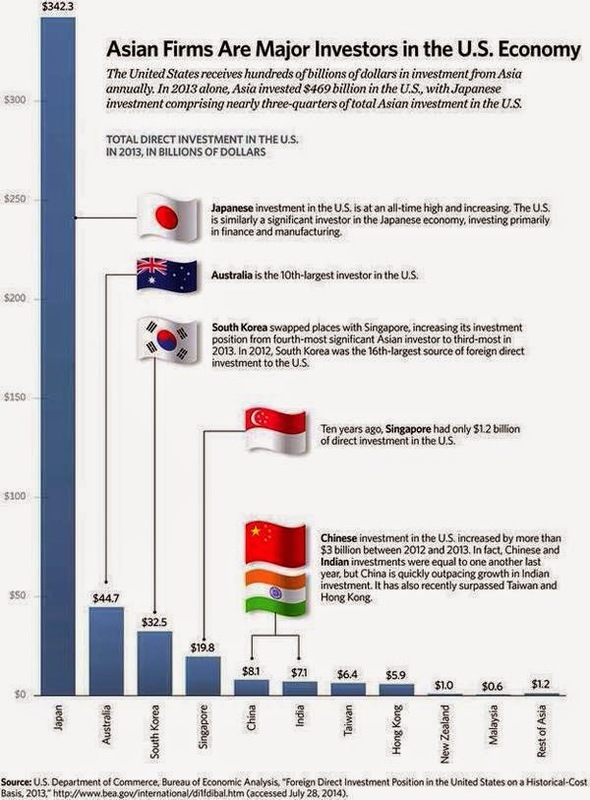 Japan is by far the largest sponsor of US foreign debt, and if the popular saying that if I owe you $1,000 it is my problem, but if I owe you $1,000,000 the problem is yours, is true, then in this case – Japanese with its $342 billion dollars invested in the US economy - more than all other countries combined - already have a problem in their hands... And a huge one, too. So, why bother to change the Japanese macro-economic structure? The answer is, a) because of the relatively independent economic strength of the Japanese economy despite its massive public debt; and b) because without real reforms the Japanese engine is already puffing and huffing, and might blow at any moment now. So, how is it that people miss to see this big picture, but focus on the details and distract their attention from the actual dynamics that underpin the current events? Apparently, people (regular consumers, whose behavior still determines a great deal of the Japanese – and else – economies) are not as “rational” as previously thought. Because people make crude calculations, rather than rational calculations; because they are busy with many other issues in their lives and prefer to follow suit, rather than act as leaders all the time, everywhere. Two brilliant articles in this week’s Economist drive home these conclusions rather brilliantly. The first one explains how easily the majority of us would err when we are presented with a simple question of calculus: If a bat and a ball cost together $1.10 and we know the bat costs $1 more than the ball, how much each of the two cost? And, no! It is not $1 and $0.10 as you might instinctively thought. The correct answer would be $1.05 and $0.05 as it is easy to forget that in the bat’s cost we must factor in the cost of the ball as well. But don’t worry – if you guessed wrong in the initial moment after the question, you are in the good company of a very large number of people. The other article sheds some light on the arrogance with which economists present speculations as undeniable truth, and make mistakes, but continue unabated with their persuasion. What happens at the end is an inability, for lack of time, attention or understanding, of a large number of people to make even simple calculations, let alone complex choices, and instead to rely on the guidance and authoritative claims of the “experts.” While, the experts are often times just as clueless as the rest of us, but with strong determination and unabated arrogance, point to the invisible path in the fog, claiming we should march with faith and strength on a suspended bridge over an abyss, that may very well not exist, or is featured only in the experts’ imagination. It would be, actually, quite cynical to be otherwise, if you think about it, so I prefer to believe this explanation instead. Back on Abeconomics, Japan’s real income per capita has fallen behind many other industrially developed economies. The weakening yen will not help the economy as much as it will hurt it, because most of the small and middle size, and even a number of big businesses depend on imported materials. Thus, their finished products will not sell so much for cheap outside Japan as the usual economic logic presupposes. This is a clear example of faulty priority of “rational” vs. “behavioral” economic principles (see the Economist article cited above). What the Abenomics do, however, is under the pretext for the need of “structural” reforms, to be bringing the ailing Japanese economy to the brink of the abyss and kicking it down the slope, while explaining how it is needed a structural reform to build an escalator out of the abyss. Finishing what Koizumi started a decade or so ago, by destroying the outer wall of the Japanese economic fortress, i.e. the savings system, the pension funds, the employment system, and the complex system of redistribution and trickling down practices that served as an oil rig inside a besieged compound that would fuel the energy needs of the fortress to keep going, Abe’s policies seem to be set to compel his countrymen pay the price to stay afloat, by bowing the Japanese economy to the mercy of shady financial corporations that build credit rankings and with them bring down governments, and countries at will (think of the difference between Spain which was solvent but put on its knees with 1/3 of Japanese public debt by these same companies). The latest example came this week, when Moody’s lowered Japan’s sovereign rating from A1 to Aa3. With world record-high deficit, Japan will have no chance to survive the pressure of foreign investors, which will take full control of the economy after the implementation of Abenomics. These are the walls Mr. Abe is determined to crumble. As to his elections, while the vote is not technically “for” or “against” Abenomics – despite what all pundits claim – the consequences from the ballot will have everything to do with it. With highly fragmented opposition, and counting on the great oblivion, misunderstanding, or otherwise outright ignorance of the majority of the Japanese voters about the real consequences of Abenomics, the only rational for Mr. Abe to call the elections remains his intention to crush his opponents inside LDP ahead of next year’s party leadership vote, who seem to grasp a glimpse of the shape and the silhouette of the big picture, so that he can push through with his agenda undisturbed for at least four to six more years. 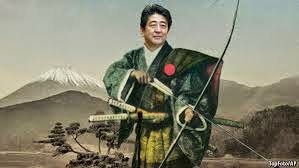 And while the Japanese voters seem to perceive Abenomics more on a spiritual level – as some kind of mystical destiny that has more of a symbolic weight than real implications – the actual big picture remains just as blurred as it is also big.